I hate you messages for bullies: Feel like giving a bully a piece of your mind without actually sounding like a bully yourself? Take ideas from this post to write a message that describes how you feel. Whether it is a guy in school, a girl in your college class or a colleague at your workplace – remind your bully that karma will eventually catch up to him or her later in life. After all, bullies are just attention seeking cowards who make fun of others to hide their own securities. Stand up to one and show them that your silence is not your weakness, it is your strength to look at life’s bigger picture. 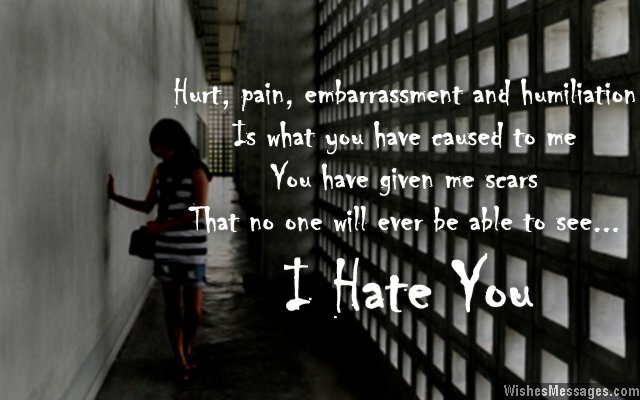 1) Hurt, pain, embarrassment and humiliation is what you have caused to me. You have given me scars that no one will ever be able to see. I hate you. 2) I hope there comes a day when someone does to you, what you did to me. Only then the hurt and the pain in my heart, will you be able to see. I hate you. 3) I wonder how a pretty face like yours got such an ugly personality. Oh by the way, I hate you. 4) Bullies like you should be paraded on the main streets to show children how exactly they must NOT grow up to be. I hate you. 5) I hate bullies like you because beneath their tough exteriors they are nothing but a little coward babies crying out for love and attention. 6) My sweetest revenge will be the day I graduate from college and get a great new job while you will be the sorry high school dropout flipping burgers for minimum wage. I hate you. 7) There should be a special place in hell for people like you and it should be called – SPECIAL TREATMENT. I hate you. 8) Right now you may think that you are cool. But life eventually will teach you a lesson and make you feel like a fool. I hate you. 9) Karma’s got my back. I hate you. 10) My silence is not my weakness. It is my strength to push negative influences like you out from my life. I hate you. 11) The cocktail of your ARROGANCE is one part IGNORANCE mixed with two parts STUPIDITY. Better do something about it quickly or else you might find yourself drowning in a cocktail of MISERY which is one part FAILURE mixed with two parts LONELINESS. I hate you. 12) When all your namesake friends dessert you because they all have something better to do – don’t come to me, because in my eyes revenge is all you are going to see. I hate you. 13) You are not a bully, because bullies are human. You are a monster, because you don’t have a heart. I hate you. 14) I am not going to do anything stupid to get my revenge. I’ll just sit on the sidelines and watch you screw your life up. I hate you. 15) I am not a bully like you so I don’t know how to take revenge. But I do hope that life comes around a full circle and someone starts treating you horribly, just the way you treated me. I hate you. 16) You crushed my confidence, you walked over my feelings. To break me down, you never stopped trying. You made fun of me, you stripped me of my respect. You ridiculed my life, and made yours seem perfect. I am waiting for the day, when my success shines out loud. You will drown in regret and remorse, of that I have no doubt. I hate you. 17) I am a victim to your bullying but that doesn’t mean I am weak. It means that I am getting stronger. I hate you. 18) You humiliated me, embarrassed me and eroded all my self-confidence. I hope karma gets back to you many times, not just once. I hate you. 19) I think about all the nasty things you say to me. I think about how you have humiliated me in front of my friends. I think about you every day, every hour and every minute. I think, I will never forget you and your cruel face. It will be a painful scar which will never heal. I hate you. 20) I am never going to take revenge by stooping to your dirty levels. But I hope that there comes a day when someone walks along and crushes your ego – just like how you crushed my respect. I hate you. 21) You wrote the worst chapter in the book of my life but in doing so, you gave yourself a one-way ticket to bad karma. I hate you. 22) Thanks for bullying me – you have made me stronger. You have better equipped to deal with all the nasty people like you I will meet in life. Thank you, but I hate you. 23) The worst part of all this is that you don’t even realize how I feel when you make fun of me every day. I hope that the day you realize it, is the day someone makes fun of you – just like how you did to me. I hate you. 24) You can bully me all you want but I want you to think about what would happen if I was the high profile criminal lawyer who you were up against, when you get tried for the mess you put yourself into later in life. I hate you. 25) You are a bully from hell, a place where you belong. I hate you. 26) Bullies like you need to remember that good students like me will one day, go on to be your bosses at work. I hate you. 27) I just don’t care what names you call me because life is too short to worry about disgusting and dirty bullies like you. I hate you. 28) You can bully me all you want right now. Because fifteen years down the line I will be the manager sitting in the glass office while you will be the one sitting outside waiting to be interviewed – by ME, for a job application in MY company. I hate you. 29) Nothing can stop me from being the person I am destined to be, not even an ugly bully like you. I hate you. 30) The way you bully me just proves that your parents never cared for you enough to show you the meaning of love. I hate you. 31) I may be weak right now but don’t pity me ever. 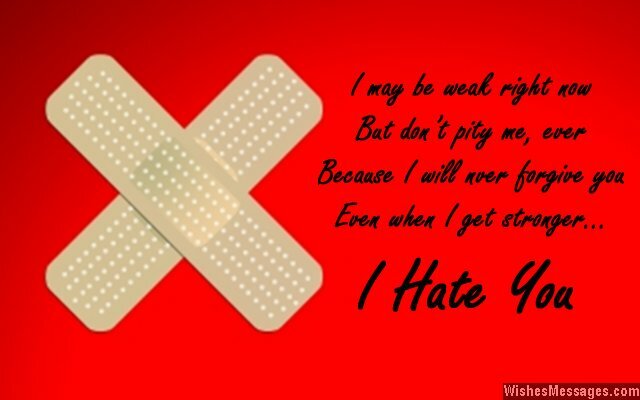 Because I will never forgive you, even when I get stronger. I hate you. 32) Do you even know how your words pierce straight through my heart? Do you even know how your actions make me hate my life to the core? Do you even know how your bad attitude makes me regret every single second I spend around you? I bet you don’t. I hate you. 33) The way you bully me makes it look like I am insecure. But we all know that your arrogance is just a layer beneath which lives a little coward who has been scarred by lack of love. 35) I wish I could tell you to ROT IN HELL but even hell won’t accept a mean bully like you. I hate you.